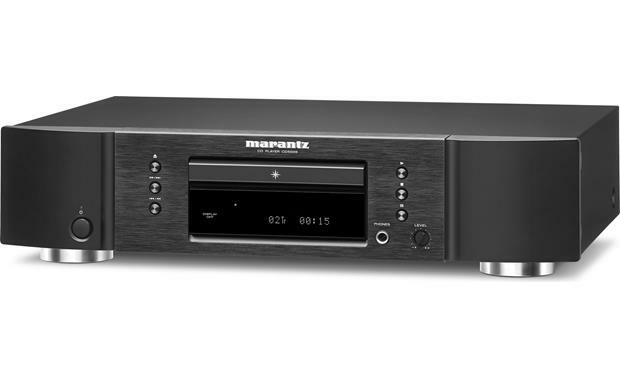 Year after year, our customers give Marantz CD players top marks for their outstanding performance. The CD5005's handsome, minimalist-style chassis is solidly built and beautifully finished. Its thick, aluminum/fiberglass faceplate and metal chassis provide a strong frame to help eliminate vibrations that can adversely affect sound quality. Inside, you'll find a precision Cirrus Logic CS4398 DAC and new CD mechanism — both borrowed from its big brother, the CD6005. Marantz also included circuitry refinements and specially selected parts straight out of their high-end Reference Series playbook, such as high-quality capacitors in the audio signal path for superior transient speed and better bass response. All of these design decisions add up to highly involving sound that reaches out to grab you from a dead-silent background. Music enthusiasts will love the CD5005's Audio EX mode. It mutes the digital audio outputs and turns off the display and pitch control. By eliminating these potential noise sources, the CD5005 delivers pristine sound quality. Headphone listeners will also appreciate the built-in, high-grade headphone amplifier for private listening sessions. Marantz even uses widely spaced, gold-plated RCA jacks that won't cramp the heavy-duty connectors found on high-quality cables. Nice CD player. Ideally, for me, the headphone jack would be replaced with an input to utilize the units DAC for other components. Not that great of a headphone stage. No complaints on the CD transport/function though. Blanks cd's comes with different cd's ie 1x4,1x48, does this machine format all blank cd's? This is a CD Player, not a CD recorder, so therefore the answer would be no. 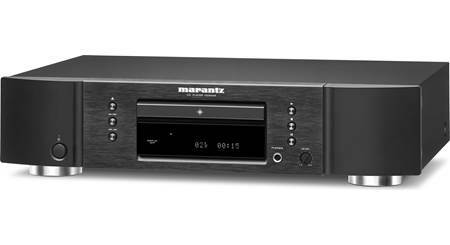 Disc Compatibility: The Marantz CD5005 Single Disc CD Player can play CD, CD-Text, CD-R, and CD-RW discs (both 12cm and 8cm discs). 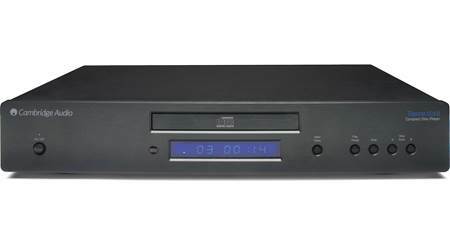 The CD5005 supports MP3 and WMA audio files that have been recorded onto CD-R or CD-RW discs in ISO9660 mode 1/2 or Juliet/Romeo disc format. 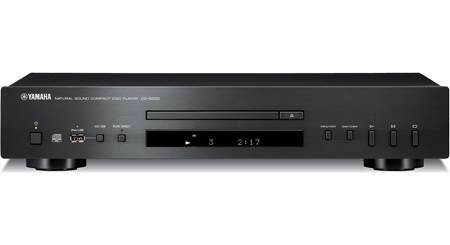 The Marantz CD player will recognize up to 255 total files and folders on a single disc. The unit will also display CD-Text, ID3, and WMA song/artist information. Note: When there are multiple folders containing MP3/WMA files, the playback order of folders is automatically set when this unit reads the media. The files in each folder are played back in the order in which the files were recorded on the media, from the oldest date and time. 24-bit/192kHz DAC: The CD5005 features high resolution D/A conversion and is equipped with the reference class CS4398 D/A converter, which provides up to 192kHz/24-bit resolution for optimum fidelity with high resolution audio file types. HDAM-SA2 (High Definition Amplifier Module): The CD5005 utilizes Marantz's Hyper Dynamic Amplifier Module, or HDAM, at critical analog circuit junctions to insure smooth and ultra-fast signal transfer from one stage to another. 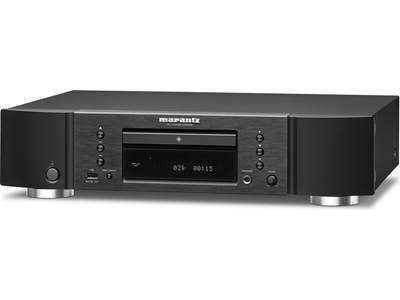 Marantz uses HDAMs instead of standard op-amps, to render a more dynamic sound with less susceptibility to radiated noise, heat, and vibration. The unit uses an HDAM-SA2 for high-speed and high-quality sound. Symmetrical Circuit Layout: To achieve the best possible sonic performance, signal paths need to be short, direct and mirror imaged. 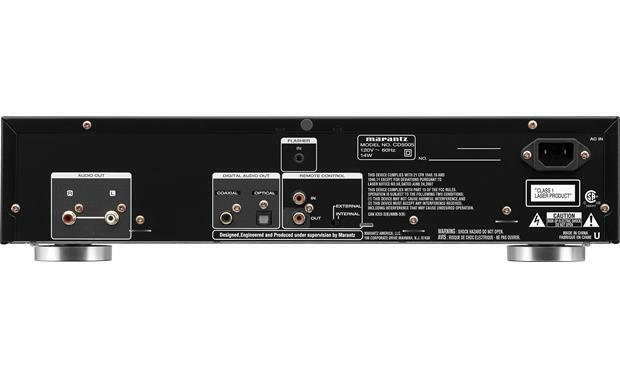 The construction of the Marantz CD5005's circuitry provides improved stereo imaging by ensuring close to perfect symmetry between right and left channel layout. High-Grade Headphone Circuit: The high-grade headphone circuit incorporates a high-speed buffer amplifier to enable headphone listening of high quality sound reproduction, late at night or in other such situations. Aluminum Front Panel: The unit's front-panel combines the structural advantages of extruded aluminum with the resonance absorption characteristics of glass-reinforced resin. 20 Track Music Calendar: A linear music calendar appears at the bottom of the display, and lights up with the number of tracks on the currently selected disc, up to 20. An "arrow" icon indicates the presence of 21 or more tracks. After a track has been played, the number for that track disappears from the calendar display. In addition, the tracks selected during Program Play appear in the music calendar display, and disappear after they are played. Note: This Music Calendar is only available when playing back Audio CDs. Gold Plated Outputs: The CD player features gold plated outputs in order to offer the best connection for your system. 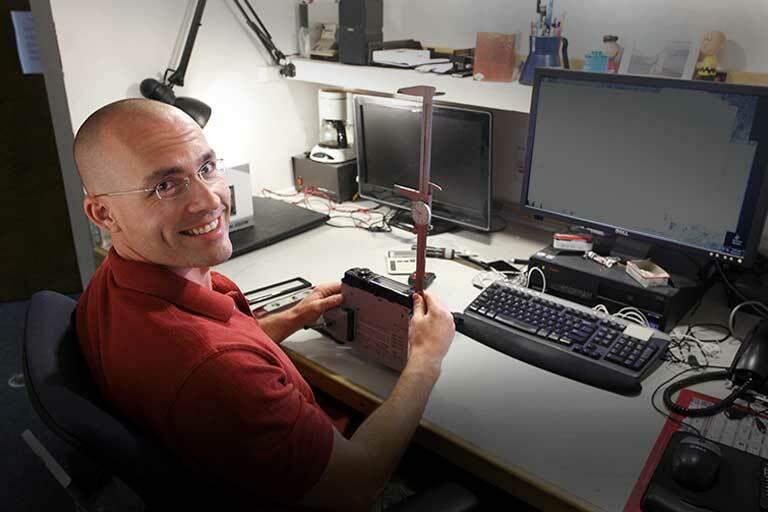 The terminals are chassis-mounted so they can take the strain of audiophile interconnects. Digital Outputs: Two digital outputs, one optical (Toslink) and one coaxial (RCA), are provided for sending signal to the digital input terminals of a receiver, outboard D/A converter, or CD recorder. Analog Output: The CD player also features a stereo RCA output for analog connection. Headphone Jack: The unit has a front panel 1/4" headphone jack with level control. The high-grade headphone circuit incorporates a high-speed buffer amplifier to enable headphone listening of high quality sound reproduction. Audio Enhancers: The Marantz CD5005 incorporates various audio adjustments to enhance your listening experience. Audio EX Function: The Audio EX mode is provided in order for you to enjoy high quality sound based on how you have connected the CD5005 to your amplifier. Audio EX bypasses the pitch control, mutes the digital output, and shuts the FL display off completely. With those three potential noise sources eliminated, you'll be able to hear everything just as the artists intended. There are three settings - Off (digital signal is only output when the pitch control setting is 0), EX 1 (offers better overall sound), EX 2 (offers best sound from analog outputs). Display On/Off Function: The CD5005 features a Dot Matrix FL display . The "Display Off" function enables the main unit display to be turned of. By turning off this display, the pulsive noise generated from the display is reduced, thus eliminating its effects on the music signals. Pitch Control: The "Pitch Control" functions enables the play speed (pitch) to be varied over a +/-12 step. This feature is particularly useful for musical instrument practice sessions. This function is only possible when playing back audio CDs only. Search Options: The CD5005 offers the following search options. Direct Search: Directly enter the track number on the remote control to play the desired track. Track Skip: Skip to the next or previous track or the beginning of the current track. Forward/Reverse Search: For searching for a particular part of the current track, you can search forward or backward. Playback Functions: The CD5005 provides the following options for disc playback. Repeat Play: You can repeat playback of one track, the entire disc, or specific portions of a track (A-B repeat). Random Play: You can play all tracks of the disc or folder in random order. Remote Control: In addition the unit's from panel controls, the single CD player comes supplied with a dedicated full-feature IR remote control for wireless operation of the CD5005. 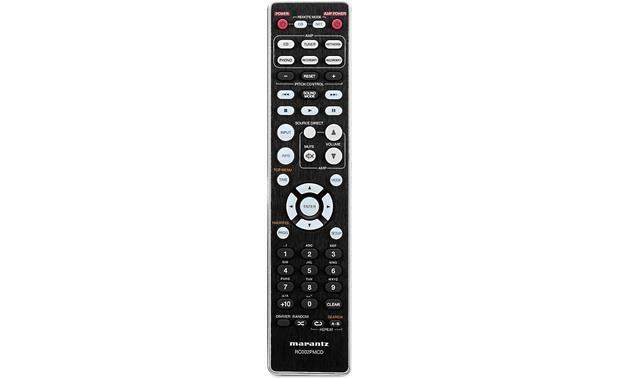 In addition, the remote has controls for a connected Marantz amplifier with input selection, volume control, and mute. Can this CD player read hybrid CDs? I'm not sure...don't even know what an hybrid CD is? Why use an optical connection ? Should both regular coax cables and optical cables( w this cd player )be connected to the external DAC for the best sound ? Thank you ! I don't know that much about using optical/coax connections. I have CD5005 connected to a true stereo receiver and use just the internal DAC, which I find produces great sound/fidelity for my system. I think it depends on which DAC you want to use. My amplifier has a DAC in it so if I had preferred to use that one I guess I would use the optical connection. Right now I am using the coax to hook into the amplifier. I hope this helped. I don't think both coax and optical should be connected at the same time. You would just use the optical if that was your desire. I do not believe that you would use both. Not to my knowledge. I went thru the on line manual and the quick start manual and there is nothing on formatting a disk. I put a blank CD in mine and it just comes up with a 00:00 play time. If it had a format function, you would think it would recognize the blank, and ask if you wanted to format. I believe it is a player only, and has no "burn" capabilities. I think so. I'm not as tech savvy as others so you may want to send an emailed question to the manufacturer. I have not encountered any issues with any of my CD's, both home made and store bought. I cannot answer that because I have only played commercial cd's, but the sound quality through the Marantz is better than previous players I have had including Yamaha, Denon, Sony and TEAC. why does this player insert silence between tracks in programme mode? Can I fix this? I have had no problems with my Marantz, playing almost daily for around 10 months. Hi Michael, I am so glad that I can talk to a real person I really want to let you know that my brand new CD player is broken after using it 3 times what can I do? I haven't used this feature yet and I operate it in EX2 mode and the features seem to be different in the different modes. But isn't it usual for there to be silence between the tracks anyway? Does this unit make a difference in the sound of the cd being played? I will be using a NAD C 375DAC integrated amp with Golden Ear Triton 7 speakers. Searches related to the Marantz CD5005 Single-disc CD player.